Spain's varied terrain makes it a prime location for interesting train journeys. These are some of our favorite train journeys in Spain. Spain's best train journeys can be divided into two types: the super-fast and the luxurious/scenic. Of course, that's not to say you aren't treated excellently on the fast trains. 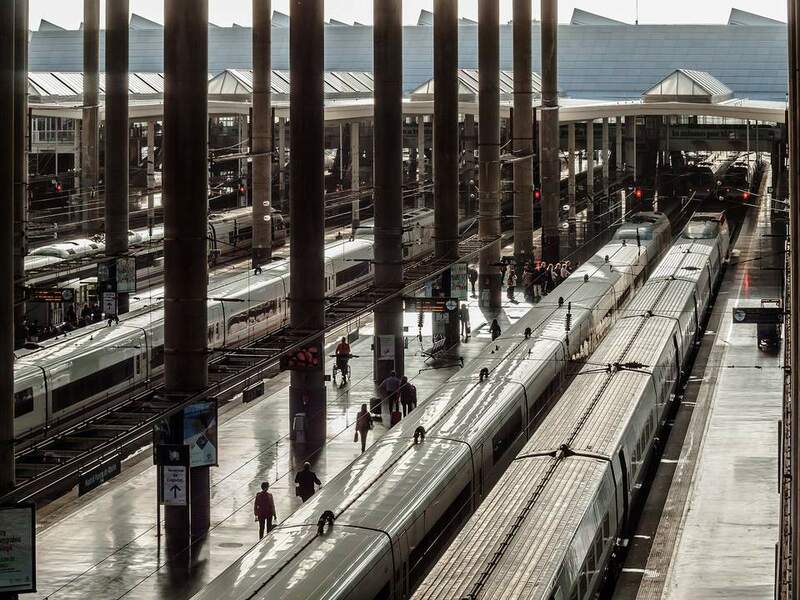 Spain has the longest high-speed rail network in Europe, with its AVE rail network that connects Madrid to Barcelona, Seville, Malaga, and Valladolid, with more destinations being added all the time. Some even run overnight. When it comes to the luxury/scenic services, you mainly have the narrow gauge network in the North to thank for that. The Trancantabrico is the most famous, while there's also the cheaper La Robla service. Spain's premier cities are now connected by a train that takes just over two-and-a-half hours. And without the need to check-in or travel to out-of-town airports, this train is a godsend. Imagine this: you could take in Picasso's Guernica at the Reina Sofia museum (across the road from the Madrid train station) in the morning and be looking at La Sagrada Familia in Barcelona the afternoon! The Transcantabrico is Spain's premier luxury train route. Sleep aboard classic narrow-gauge trains and visit the best sights in northern Spain in style. Routes start or finish in Santiago de Compostela and take in the cities of Bilbao, Leon, and Oviedo and the stunning mountain range of the Picos de Europa. The original AVE high-speed train in Spain, this route has been shuttling tourists and businessmen between the capital and Andalusia's premier city since 1992. The journey takes just two-and-a-half hours, as opposed to more than six hours by bus. The train from Madrid to Seville is also available as part of a guided tour, either as a day trip from Madrid to Seville or as a two- or three-day trip that also includes Cordoba and/or Caceres. The journey to the Montserrat mountain is a treat in itself. Tarragona is a popular day trip from Barcelona, particularly for its Roman ruins. Though there is an airport very close to Tarragona (Reus Airport) and the main Barcelona airport is closer to Tarragona than Barcelona city is, public transport connections are actually best from Barcelona city center to Tarragona. If the Transcantrabrico is too expensive, the 'budget' version takes in fewer destinations and is a step down in quality, but (when you consider that all accommodation, food and guided tours are paid for) it's a great value. The train departs from Bilbao and reaches Leon, before turning back and dropping you off in Bilbao again. The Euskotren is the Basque Country's local rail service. It's the slow way to travel from Bilbao to San Sebastian and on to the French border, but it's worth it. I spent an enjoyable three hours taking in the sights out of the window. The mountains, green fields and commuter towns along this route add an excellent dimension to your Basque Country visit that you might not normally see. It's cheap, too. Climb to the top of Mount Artxanda on the Bilbao Funicular to get a spectacular view of Bilbao. See the Guggenheim museum from a totally different perspective. The Bilbao funicular departs from Calle Castaños, close to the Guggenheim. This is a great touristic route from Lleida to Pobla de Segur. Take a day trip the UNESCO World Heritage Site of Aranjuez on a vintage train. The train journey begins from Madrid's rail museum, during which you'll be served strawberries by the waitresses and then transferred to the historic old town of Aranjuez, where you'll be offered a guided a tour of the royal palace. Unfortunately, tours are only in Spanish.